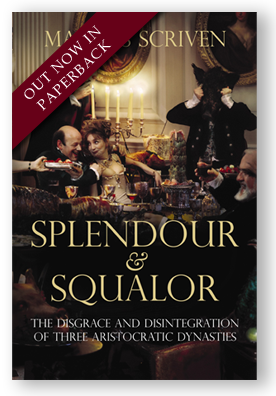 Index: Obscure production reasons meant that the hardback edition of Splendour & Squalor lacks an index. This is a slightly more detailed version of the one which appears in the paperback edition. Sources: It was originally hoped to include comprehensive source notes in both the hardback and paperback editions of Splendour & Squalor, but, since these notes totalled more than 1,500 in number, they were jettisoned. They will gradually appear here… Recorded speech in the present tense results from an interview, by telephone or in person, or from a letter by the person quoted. A substantial amount of recorded speech in the past tense is similarly derived from interview or correspondence. Marcus Scriven is researching his second book. Its central character is another twentieth century aristocrat, summarised by a first cousin as: ‘a very attractive man…a psychopath, of course’.